The Trinity holds my record for highest number of cats seen in a pub in one evening. 3! That was before going to see Orbital, last autumn. The Pineapple used to be a lovely old-fashioned pub until it got the sofas-and-chalkboards treatment. Now it’s indistinguishable from a thousand overs. That afternoon when they had changed the carpet, I was in the Trinity from about 4pm, and had the joy of seeing some sales rep from a flavoured Sambucca company crashing and burning while the barmaid clocking off at five got wasted on all of his samples. Happy days. 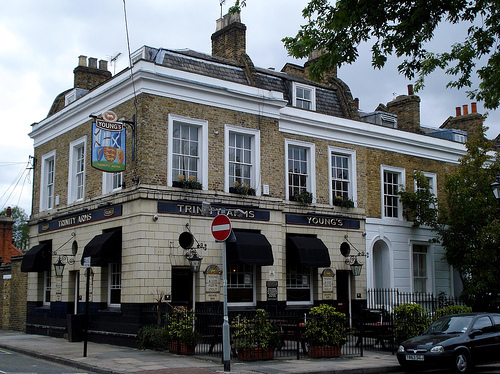 I suspect this might be the pub in London that has held more internet forum meet-ups than any other. These days I reckon you’re pretty much guaranteed one for every night there’s a gig. Perhaps that pub that used to be the Goose runs it close. No 19: The Blue Posts, Newman St.
so i try and remember to write about stuff, but often i forget. one day i will blog scooterman, but not today.